If you are like most Australians, you are probably running out of space in your home and need a storage solution fast… The good news is, you are at the right place! 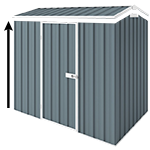 Cheap Sheds is the leading online retailer for backyard storage units in Australia. We provide the largest range of high quality, Australian made sheds right here, all in one spot. We have over 1,000 products, which include DIY garden sheds, garages, carports, aviaries, pool pump covers and accessories. We deliver to customers all over Australia so shopping for storage sheds has never been easier. From apartment living and family homes, right down to those living on farms… we have products to cater for everyone’s needs. So have a look around or chat to our friendly customer service team who can help find the right solution for you.